It’s now easy to make cocktails and ensure your party has all the drinks it needs. 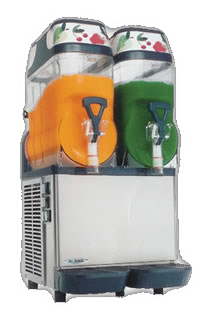 Stand out from the crowd and make your party one to remember and hire your very own cocktail machine. Ice not required ... your cocktail/slushy machine does it all! And don’t forget the kids … all flavours are available as non-alcoholic slushy drinks with our machine. We supply your choice of TWO mixers (see below), plus instructions and some favourite cocktail recipes. We deliver your Cocktail Machine all ready to go! Optionally add your own favourite alcohol (750 ml) and you have instant frozen cocktails all night long!